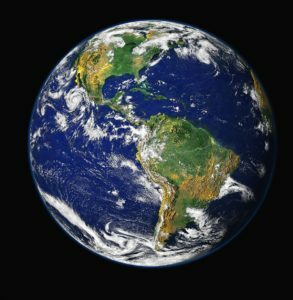 An international research project led by the University of Granada has revealed for the first time that almost one billion viruses and more than twenty million bacteria circulate in the Earth's atmosphere and are deposited in high-mountain places every day. The research findings, published recently in the ISME Journal: Multidisciplinary Journal of Microbial Ecology (part of the Nature group) help to explain why genetically identical viruses have been found in such distant locations and diverse environments of the planet. The University of British Columbia (Canada) and San Diego State University (United States) also participated in the project. ...continue reading "Viruses and Bacteria Circle the Earth and Fall In Rain and Dust"
The following article is about Dr. Janelle Ayres, a researcher in California, working on "beneficial bacteria" to help the body tolerate infections. This is different than the usual medical approach of fighting infections - where antibiotics are used to kill microbes. Reading the article, my first thought was "Well, duh....of course this approach works." This is what we've been doing in using Lactobacillus sakei, a beneficial bacteria, in successfully treating sinusitis since early 2013! ..... The good news in reading this article is that using bacteria to treat infections or diseases seems to finally be going mainstream. As her father lay dying of sepsis, Janelle Ayres spent nine agonizing days at his bedside. When he didn’t beat the virulent bloodstream infection, she grieved. And then she got frustrated. She knew there had to be a better way to help patients like her dad. In fact, she was working on one in her lab. Ayres, a hard-charging physiologist who has unapologetically decorated her lab with bright touches of hot pink, is intent on upending our most fundamental understanding of how the human body fights disease. 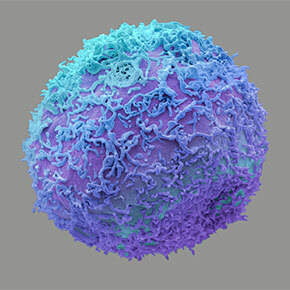 Scientists have focused for decades on the how the immune system battles pathogens. Ayres believes other elements of our physiology are at least as important — so she’s hunting for the beneficial bacteria that seem to help some patients maintain a healthy appetite and repair damaged tissue even during bouts of serious disease. If she can find them — and she’s already begun to do so — she believes she can develop drugs that will boost those qualities in patients who lack them and help keep people alive through battles with sepsis, malaria, cholera, and a host of other diseases. Her approach, in a nutshell: Stop worrying so much about fighting infections. Instead, help the body tolerate them. An associate professor at the Salk Institute in the heart of San Diego’s booming biotech beach, Ayres is harnessing all manner of high-tech tools from the fields of microbiomics, genetics, and immunology — and looking to a menagerie of animals — to sort out why some individuals tolerate infection so much better than others. It’s work that’s desperately needed, Ayres said, as it becomes ever more clear that our standard approach to fighting infection using antibiotics and antivirals is hopelessly inadequate. The drugs don’t work for all diseases, they kill off good bacteria along with bad — and their wanton use is contributing to the rise of antibiotic resistant bacteria, or “superbugs,” which terrify disease experts because there are few ways to stop them. Society needs drugs that don’t target bacteria, which can so quickly evolve to evade our best medicines, she argues. Instead, she thinks we can harness those bacteria — even the ones normally classified as pathogens — to make new drugs that save lives by targeting an infected person’s tissues and organs. That would be an entirely new class of therapeutics, which could lessen our dependence on antibiotics and help save lives in cases, like her father’s, where antibiotics fail. She’s been working furiously in her own lab, rolling out a series of studies that have found critical targets for new drugs. Her main focus: the trillions of bacteria — known collectively as the microbiome — that reside in our bodies but do not sicken us. Ayres suspects they might play a key role in the tolerance defense system. But if bacteria do help increase tolerance to disease, what strains are involved and what exactly are they doing? Will We Use Predator Bacteria To Destroy Superbugs In the Future? Author SimaPublished on June 15, 2017 June 26, 2018 Leave a comment on Will We Use Predator Bacteria To Destroy Superbugs In the Future? Great idea and one that this blog has been pushing for a long time - the use of beneficial bacteria to get rid of other harmful bacteria. Some researchers refer to the bacteria acting as "living antibiotics" when they overpower harmful bacteria. The woman in her 70s was in trouble. What started as a broken leg led to an infection in her hip that hung on for two years and several hospital stays. At a Nevada hospital, doctors gave the woman seven different antibiotics, one after the other. The drugs did little to help her. Lab results showed that none of the 14 antibiotics available at the hospital could fight the infection, caused by the bacterium Klebsiella pneumoniae.... The CDC’s final report revealed startling news: The bacteria raging in the woman’s body were resistant to all 26 antibiotics available in the United States. She died from septic shock; the infection shut down her organs. ...continue reading "Will We Use Predator Bacteria To Destroy Superbugs In the Future?" Published on June 15, 2017 June 26, 2018 Categories microbesTags antibiotics, bacteria, Bdellovibrio bacteriovorus, predatory bacteria, superbugsLeave a comment on Will We Use Predator Bacteria To Destroy Superbugs In the Future? 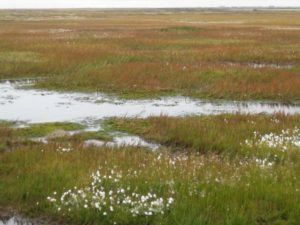 What Disease Microbes Will Be Released From Thawing Permafrost? Author SimaPublished on October 31, 2016 March 27, 2018 Leave a comment on What Disease Microbes Will Be Released From Thawing Permafrost? Human viruses from even further back could also make a showing. For instance, the microorganisms living on and within the early humans who populated the Arctic could still be frozen in the soil. “There are hints that Neandertals and Denisovans could have settled in northern Siberia [and] were plagued by various viral diseases, some of which we know, like smallpox, and some others that might have disappeared,” Claverie says....Janet Jansson, who studies permafrost at the Pacific Northwest National Laboratory in Washington State, is not worried about ancient viruses. Several attempts to discover these infectious agents in corpses have come up empty, she notes. Published on October 31, 2016 March 27, 2018 Categories microbesTags anthrax, bacteria, thawing permafrost, virusesLeave a comment on What Disease Microbes Will Be Released From Thawing Permafrost? Beautiful photos of the microbes within and on us by the British scientific photographer Steve Gschmeisser. Check out his site (http://www.theworldcloseup.com/) to see photos of microbes and other images made with the very expensive SEM - a scanning electron microscope. All the photos are by Steve Gschmeisser. 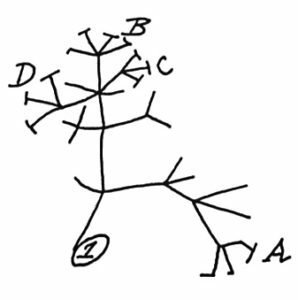 In 1837, Charles Darwin sketched a simple tree of life (shown left) to illustrate the idea that all living things share a common ancestor. Ever since then, scientists have been adding names to the tree of life, including a massive effort of 2.3 million named species of animals, plants, fungi and microbes in 2015. A tree of life is a visual hypothesis of how scientists think species are related to one another, so it has been evolving over the years as more information is learned and species discovered. Scientists have dramatically expanded the tree of life, which depicts the variety and evolution of life on Earth, to account for over a thousand new microscopic life forms discovered over the past 15 years. The expanded view finally gives bacteria and Archaea their due, showing that about two-thirds of all diversity on Earth is bacterial -- half bacteria that cannot be isolated and grown in the lab -- while nearly one-third is Archaeal. The new tree, to be published online April 11 in the new journal Nature Microbiology, reinforces once again that the life we see around us -- plants, animals, humans and other so-called eukaryotes -- represent a tiny percentage of the world's biodiversity. 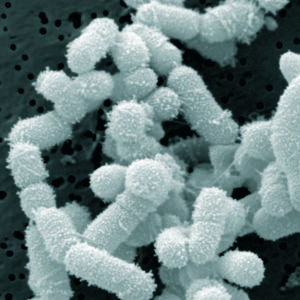 "Bacteria and Archaea from major lineages completely lacking isolated representatives comprise the majority of life's diversity," said Banfield.....According to first author Laura Hug,... the more than 1,000 newly reported organisms appearing on the revised tree are from a range of environments, including a hot spring in Yellowstone National Park, a salt flat in Chile's Atacama desert, terrestrial and wetland sediments, a sparkling water geyser, meadow soil and the inside of a dolphin's mouth. All of these newly recognized organisms are known only from their genomes. One striking aspect of the new tree of life is that a group of bacteria described as the "candidate phyla radiation" forms a very major branch. 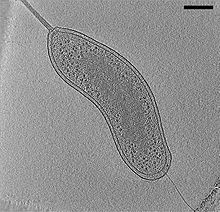 Only recognized recently, and seemingly comprised only of bacteria with symbiotic lifestyles, the candidate phyla radiation now appears to contain around half of all bacterial evolutionary diversity. Charles Darwin first sketched a tree of life in 1837 as he sought ways of showing how plants, animals and bacteria are related to one another. The idea took root in the 19th century, with the tips of the twigs representing life on Earth today, while the branches connecting them to the trunk implied evolutionary relationships among these creatures.....Archaea were first added in 1977 after work showing that they are distinctly different from bacteria, though they are single-celled like bacteria. 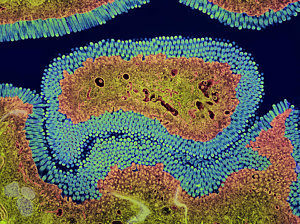 A tree published in 1990 by microbiologist Carl Woese was "a transformative visualization of the tree," Banfield said. With its three domains, it remains the most recognizable today. With the increasing ease of DNA sequencing in the 2000s, Banfield and others began sequencing whole communities of organisms at once and picking out the individual groups based on their genes alone. This metagenomic sequencing revealed whole new groups of bacteria and Archaea, many of them from extreme environments, such as the toxic puddles in abandoned mines, the dirt under toxic waste sites and the human gut. Some of these had been detected before, but nothing was known about them because they wouldn't survive when isolated in a lab dish. This is a new and expanded view of the tree of life, with clusters of bacteria (left), uncultivable bacteria called 'candidate phyla radiation' (center, purple) and, at lower right, the Archaea and eukaryotes (green), including humans. 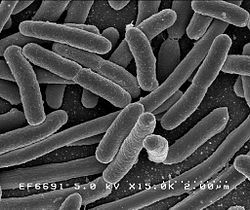 A recent study has examined the issue of whether the 10 to 1 ratio of bacteria to human cells, which is widely quoted, is actually correct. Weizmann Institute of Science researchers currently feel that based on scientific evidence (which of course will change over time) and making "educated estimates", the actual ratio is closer to 1:1 (but overall there still are more bacterial than human cells). They point out that the 10:1 ratio was originally a "back of the envelope" estimate dating back to 1972. How many microbes inhabit our body on a regular basis? For the last few decades, the most commonly accepted estimate in the scientific world puts that number at around ten times as many bacterial as human cells. In research published in the journal Cell, a recalculation of that number by Weizmann Institute of Science researchers reveals that the average adult has just under 40 trillion bacterial cells and about 30 trillion human ones, making the ratio much closer to 1:1. The original estimate that bacterial cells outnumber human cells in the body by ten to one was based on, among other things, the assumption that the average bacterium is about 1,000 times smaller than the average human cell. The problem with this estimate is that human cells vary widely in size, as do bacteria. For example, red blood cells are at least 100 times smaller than fat or muscle cells, and the microbes in the large intestine are about four times the size of the often-used "standard" bacterial cell volume. The Weizmann Institute scientists weighted their computations by the numbers of the different-sized human cells, as well as those of the various microbiome cells. The human microbiome has emerged as an area of utmost interest....One of the most fundamental and commonly cited figures in this growing field is the estimate that bacteria residing in the human body outnumber human cells by a factor of 10 or more (Figure 1A). This striking statement often serves as an entry point to the field. After all, if a human being is a cell population composed of at least 90% bacteria, it is only natural to expect a major role for them in human physiology. Both the numerator (number of microbial cells) and the denominator (human cells) of this 10:1 ratio are based on crude assessments. Most sources cite the number of human cells as 1013 or 1014.....We performed a thorough review of the literature and found a long chain of citations originating from one “back of the envelope” estimate (Figure 1). This estimate, though illuminating, was never meant as the final word on the question. Recently, the estimate of a 10:1 bacterial to human cell ratio (B/H) ratio has received criticism (Rosner, 2014). Therefore, an alternative value and an estimate of the uncertainty range are needed. 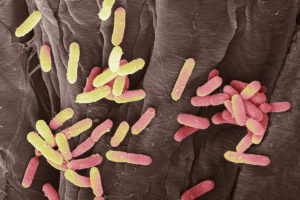 Bacteria are found in many parts of the human body primarily on the external and internal surfaces, including the gastrointestinal tracts, skin, saliva, oral mucosa, and conjunctiva. The vast majority of commensal bacteria reside in the colon, with previous estimates of about 1014 bacteria (Savage, 1977), followed by the skin, which is estimated to harbor ∼1012 bacteriaBerg, 1996). Less than 1012 bacteria populate the rest of the body.....Almost all recent papers in the field of gut microbiota directly or indirectly rely on a single paper (Savage, 1977) discussing the overall number of bacteria in the gut. Interestingly, review of the original Savage 1977 paper demonstrates that it actually cites another paper for the estimate (Luckey, 1972)....The estimate, performed by Luckey in 1972, is an illuminating example of a back-of-the-envelope estimate, which was elegantly performed, yet was probably never meant to serve as the cornerstone reference number to be cited decades later. 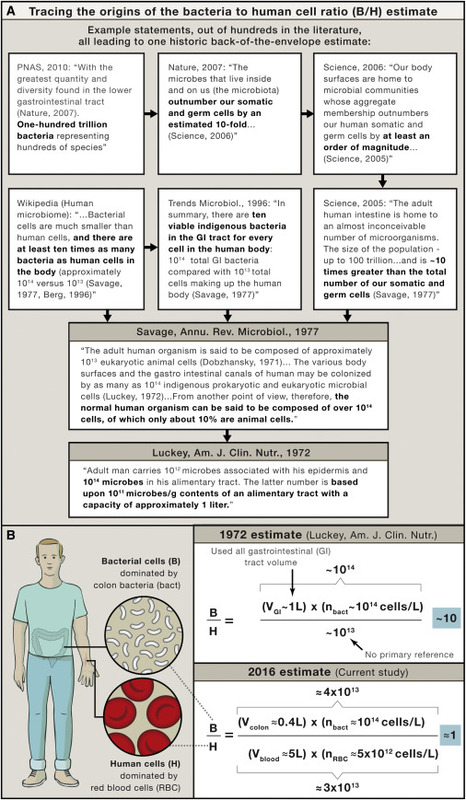 Updating the ratio of bacteria to human cells from 10:1 or 100:1 to closer to 1:1 does not take away from the biological importance of the microbiota. ...Although we still appear to be outnumbered, we now know more reliably to what degree and can quantify our uncertainty about the ratios and absolute numbers. The B/H ratio is actually close enough to one, so that each defecation event, which excretes about 1/3 of the colonic bacterial content, may flip the ratio to favor human cells over bacteria. This anecdote serves to highlight that some variation in the ratio of bacterial to human cells occurs not only across individual humans but also over the course of the day. Once again, two opposing views about beards have been in the news - that they harbor all sorts of nasty disease-causing bacteria vs they are hygienic. An earlier May 5, 2015 post was about the question of whether bearded men have more bacteria on their faces than clean shaven ones. I cited a 2014 study found that they don't, and that we are all covered with bacteria, all sorts of bacteria, and this is normal. Now another study has looked at the issue of hospital workers with and without beards and whether they carry infectious bacteria. Researchers swabbed the faces (center of the cheek and the skin of the upper lip under the nostrils) of both clean shaven individuals and individuals with facial hair (beards) that worked in two hospitals (they all had direct contact with patients) and looked at the bacteria present. They especially looked for the presence of the bacteria Staphylococcus aureus, which surprisingly was found more in the clean-shaven men. Also to their surprise, it was more of the clean shaven men who carried the pathogenic bacteria Methicillin-resistant Staphylococcus aureus (also known as MRSA). For those bacterial groups most closely associated with hospital acquired infections, such as Klebsiella species, Pseudomonas species, Enterobacter species., and Acinetobacter species, prevalence was low in both groups, and less than 2% for each group. And why is that? According to the study, one explanation is "microtrauma to the skin," which occurs during shaving and results in abrasions, which could support bacterial colonisation and growth of bacteria on the clean-shaven men. 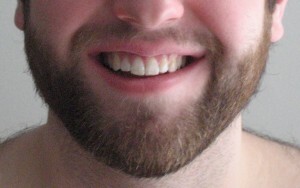 However, some other researchers have a different hypothesis — that beards themselves actually fight infection. This stems from an experiment carried out by Dr. Michael Mosley who recently swabbed the beards of a variety of men and sent the samples to Dr. Adam Roberts, a microbiologist at University College London. Roberts grew more than 100 different bacteria from the beard samples, but found that in a few of the petri dishes a microbe was killing the other bacteria - a bacteria called Staphylococcus epidermidis, and which they believe has antibiotic properties. Summary: It is unknown whether healthcare workers' facial hair harbours nosocomial pathogens. We compared facial bacterial colonization rates among 408 male healthcare workers with and without facial hair. Workers with facial hair were less likely to be colonized with Staphylococcus aureus (41.2% vs 52.6%, P = 0.02) and meticillin-resistant coagulase-negative staphylococci (2.0% vs 7.0%, P = 0.01). Colonization rates with Gram-negative organisms were low for all healthcare workers, and Gram-negative colonization rates did not differ by facial hair type. Overall, colonization is similar in male healthcare workers with and without facial hair; however, certain bacterial species were more prevalent in workers without facial hair. [Excerpts from Discussion]:Several studies to date have demonstrated that physician white coats and neck ties can act as significant sources of nosocomial bacteria. Our study suggests that facial hair does not increase the overall risk of bacterial colonization compared to clean-shaven control subjects. Indeed, clean-shaven control subjects exhibited higher rates of colonization with certain bacterial species. 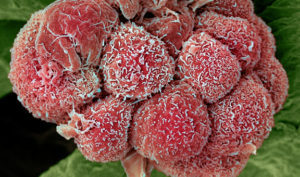 This finding may be explained by microtrauma to the skin during shaving resulting in abrasions, which may support bacterial colonization and proliferation. This may be akin to the enhanced risk of surgical site infections in patients shaved with razors prior to surgery. Further, our results are consistent with prior evidence pertaining to bacterial colonization on the hands and nares of HCWs (Health care workers). Considering the prevailing winds, David J. Smith figured the air samples collected atop a dormant volcano in Oregon would be full of DNA signatures from dead microorganisms from Asia and the Pacific Ocean. He didn’t expect anything could survive the journey through the harsh upper atmosphere to the research station at the Mount Bachelor Observatory, at an elevation of 9,000 feet. But when his team got to the lab with the samples, taken from two large dust plumes in the spring of 2011, they discovered a thriving bunch of hitchhikers. More than 27 percent of the bacterial samples and more than 47 percent of the fungal samples were still alive. Ultimately, the team detected about 2,100 species of microbes, including a type of Archea that had only previously been isolated off the coast of Japan. “In my mind, that was the smoking gun,“ Smith says. Asia, as he likes to say, had sneezed on North America. "I regard the atmosphere as a highway, in the most literal sense of the term," Smith says. "It enables the exchange of microorganisms between ecosystems thousands of miles apart, and to me that’s a more profound ecological consequence we still have not fully wrapped our heads around." Airborne microbes potentially have huge impacts on our planet. Some scientists attribute a 2001 foot-and-mouth outbreak in Britain to a giant storm in north Africa that carried dust and possibly spores of the animal disease thousands of miles north only a week before the first reported cases. Bluetongue virus, which infects domestic and wild animals, was once present only in Africa. But it's found now in Great Britain, likely the result of the prevailing winds. In west Texas, researchers from Texas Tech University collected air samples upwind and downwind of ten cattle feedlots. Antibiotic resistant microbes were 4,000 percent more prevalent in the downwind samples. .... What's clear is there are far more viable microbes in far more inhospitable places than scientists expected. Dust talks. That clump of gray fuzz hiding under the couch may look dull, but it contains multitudes: tiny errant crumbs of toast, microscopic fibres from a winter coat, fragments of dead leaves, dog dander, sidewalk grit, sloughed-off skin cells, grime-loving bacteria. “Each bit of dust is a microhistory of your life,” Rob Dunn, a biologist at North Carolina State University, told me recently. For the past four years, Dunn and two of his colleagues—Noah Fierer, a microbial ecologist at the University of Colorado Boulder, and Holly Menninger, the director of public science at N.C. State—have been deciphering these histories, investigating the microorganisms in our dust and how their lives are intertwined with our own. 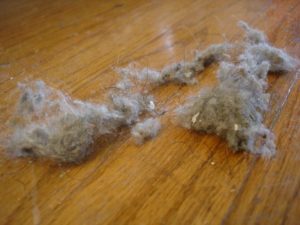 ...continue reading "House Dust Contains a Microhistory of Our Life"